Size 10 UK. 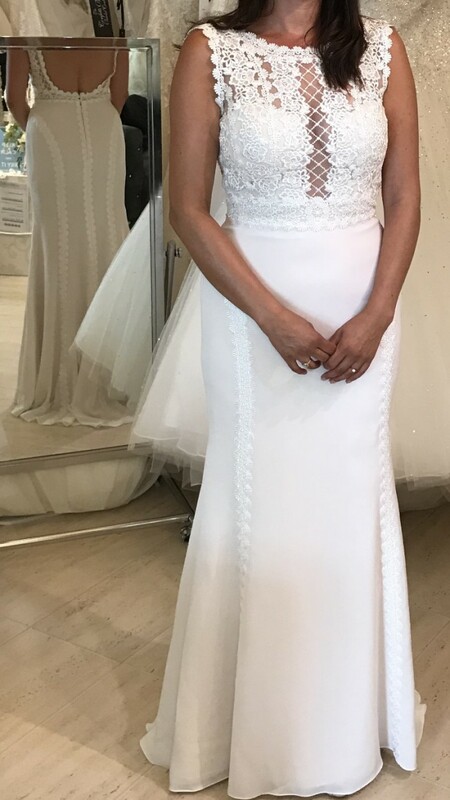 Gorgeous lace motifs trail over the bodice and Ballantine Crepe Chiffon skirt, creating an illusion jewel over plunging square neckline and illusion back with lace up ribbon detail. Fit-and-flare lined with shapewear for a luxe fit. Includes Samara Chiffon ties and delicate lace ribbon ties (not pictured) to suit your individual taste. Finished with zipper closure. I wore it without ties for an open back. The colour is an amazing Ivory over Cafe. I only wore this dress for a few hours after the 1st dance. It is dry cleaned and from a pet and smoke free home. Once you send a message, Claudia can invite you to purchase the dress.